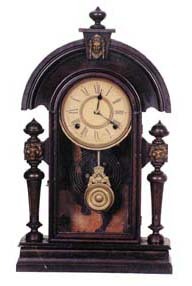 Ansonia Clock Co. "King", ca 1901. 22 inch black walnut case, never refinished or cleaned, metal lions head ornaments on the posts and a ladies bust on top. Old paper dial and Ansonia pendulum. Old black paper covering on the backboard is flaking, was never a label there. I would put black paper back, would sure make the clock look good. It appears to be all original just needs some TLC. 8 day, half hour strike on a coil gong, signed gong base. Ly-Ansonia No.1776.